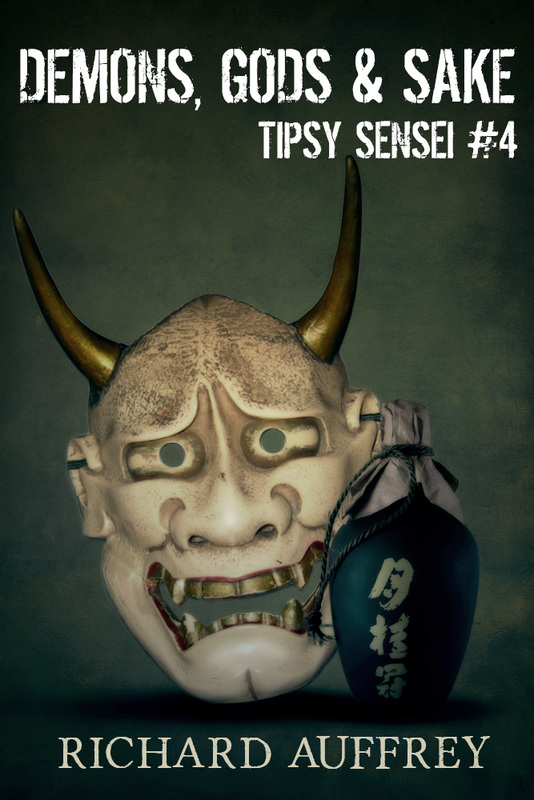 The Tipsy Sensei series continues in a new novel that is now available through Amazon as an Ebook. 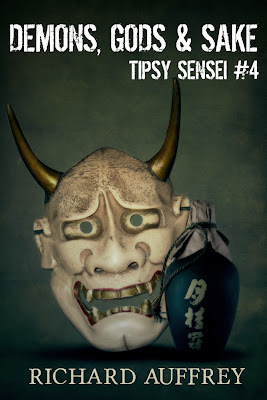 Demons, Gods & Sake is the 4th installment of the Tipsy Sensei series and the stakes for Nate Randall, a Sake expert from Boston, couldn't be higher. Later this month, Demons, Gods & Sake will also be published as a Trade Paperback and I hope to do some local signings. As soon as it is available as a paperback, I will let everyone know. Though I recommend that you read the first three stories in the Tipsy Sensei story before reading this novel, it is not a necessity. It is a self-contained story, describing the main events of the prior three stories. Please also understand that you can read this novel even if you do not own a Kindle. You can download a Free App for your computer or smart phone that will allow you to read Kindle ebooks. To the Japanese, the number 4 is considered unlucky because it is sometimes pronounced shi, which is also the word for death. In Tipsy Sensei #4, there is much death and the entire world faces a dire threat. Two months ago, Nate Randall, a Sake expert, received an enigmatic phone call warning him that an Oni, a Japanese demon, might be in Boston. After having previously encountered other supernatural creatures from Japanese folklore, Nate had little trouble believing that a demon could threaten Boston. Now, his fears have come true. A formidable Oni is in Boston, seeking an ancient weapon of power and willing to kill anyone in its way. This weapon might be a legendary sword, the Doji-Giri Yasutsuna, once used to kill the great Oni Shuten-doji. Nate faces other dangers too, as the Oni is not the only party seeking the weapon. A ruthless Yakuza clan is also involved. Nate soon finds himself being pursued by these enemies as he might possess the key to locating this magical artifact. Nate receives assistance from a mysterious ally, but can he be trusted? And what secrets is that ally concealing? In his previous adventures, the stakes were on a relatively minor scale. This time, the fate of the world might depend on Nate's actions. Can Nate prevent his enemies from acquiring this powerful weapon? What will he have to sacrifice to prevent his enemies from winning? The action spans the globe, from Boston to Japan, introducing new characters and bringing back others connected to previous stories in the Tipsy Sensei series. The stakes have never been higher, the action has never been more exciting, and the twists have never been more intriguing. Check out this latest installment in the thrilling Tipsy Sensei urban fantasy series. While you read Tipsy Sensei #4, I'll be working on Nate's next supernatural adventure. "Cheese is milk made immortal." Why is the "Donut Guy" making cheese in Vermont? I'll provide you an answer shortly. In an informal poll on Twitter, I asked people if they would rather have a sweet dessert or a cheese plate. Overwhelmingly, people opted for the cheese! It is obvious that people, including myself, love cheese and want more of it. What are the good local restaurants which offer compelling cheese plates? One top choice is L'Espalier, a restaurant which really needs no introduction and hosts numerous events including their montly Cheese Tuesday. This event features a three course dinner, paired with wines, ending with a cheese tasting. In addition, cheese is usually used in all of the dinner courses. Fromager and mâitre d’ Louis Risoli hosts the evening and sommelier Erich Schliebe discusses the wine pairings, both who do a fine job during the course of the evening. Last week, I attended Cheese Tuesday, as a media guest, and the cheeses of Vermont Butter & Cheese Creamery were showcased, the third time they have presented at the restaurant. L'Espalier and the Vermont Creamery have had a relationship extending back at least 20 years, and their butter has been on their tables for all that time. Maybe 40-50 people attended this cheese event, and we all sat in a private dining room. As expected, L'Espalier impressed with their quality food and impeccable service, and made sure the event was fun, not stuffy or pretentious. If you love cheese, then I strongly recommend you check out L'Espalier's Cheese Tuesdays. Vermont Butter & Cheese Creamery was founded in 1984 by Allison Hooper and Bob Reese. Allison spent time working on a goat farm in the Loire of France and that is where she learned how to make goat cheese. It is also the reason many of her cheeses now are very Loire in style. Vermont Creamery started out as a farmstead company, which meant they raised their own goats, but that is no longer the case and they now purchase their goat milk from a network of local farms. In the 1980s, few local people knew much about goat cheese so it was an arduous effort to try to sell them. Most restaurant owners and chefs only wanted to carry French cheeses. Allison though persevered, bringing her basket of cheeses to many different restaurants. Once the chefs and owners tasted her cheeses, then they became believers and her business grew over time. Currently, though their main emphasis is goat cheese, they do make some cow milk cheeses as well. They are also in the process of purchasing a farm to use for educational purposes, to teach people what they do, to get people more in touch with nature, animals and such. At the dinner, Karen Daseke, their Boston Sales Director, spoke about Vermont Creamery and later presented Joey Conner, the Aged Cheese Team Leader (pictured above). Joey started as a chef, trained at the Culinary Institute of America, and eventually noticed an ad in a local Vermont newspaper for a position as a manager of an aged cheese division. This intrigued him so he applied for the job and received it. Since then, he has immersed himself in the cheese making business, bringing plenty of passion. He has become affectionately known as the "Donut Guy," after the hardworking guy depicted in the old Dunkin' Donut commercials. It is also said that Joey brought the "wrinkles" back to their cheese, the wrinkled rind generally being a sign of aging. Before dinner began, we were served fresh bread, focaccia and a cheddar cheese topped roll, with Vermont Creamery butter, which was lightly salted. Though I enjoyed both breads, the cheese rolls were superb, with a crusty layer of cheddar atop a light, airy roll. The servers continued to offer more bread throughout the course of the dinner. This is a restaurant that truly understands the allure of fresh bread, and as such, occupies a special place in my heart. I recently talked with a couple friends about this very issue, how so many restaurants have cut back on serving bread, which I think is a shame. A great bread can really enhance one's dining experience. Our first course was an Apple Street Farm Beet Salad with quark, cranberries and walnuts. Quark is a soft farmhouse cheese, kind of a German version of cottage cheese, though it is smooth and creamy. It has a mild, creamy taste and it will make you wonder why you need lumpy cottage cheese. This was the fitst time I have tasted quark, but it certainly won't be the last. The rest of the salad was fresh with some tart apple slices and the walnuts added a nice texture as well. The salad was paired with a delicious NV Lucien Albrecht Brut Rose, Cremant d'Alsace, which was crisp and clean with delicious red fruit flavors and plenty of minerality. The second course was Pappardelle with roasted butternut squash, duck confit, creme fraiche and fromage blanc. The perfectly cooked pasta served as a fine palette for the combination of creamy cheese, earthy duck and sweet squash. The pairing was the intriguing 2007 Movia Veliko Bianco, a blend of 70% Ribolla Gialla, the rest being Sauvignon Blanc and Pinot Gris. The wine maker is very noninterventionist, adding no sulfur, and relying often on the lunar calendar. Plenty of acidity, with a fascinating blend of lychee, pineapple and dried fruit flavors. Not a typical white wine, and that is a good thing. The Roasted Loin of Lamb was superb, tender and flavorful, and was accompanied by a sausage stuffed Apple Street Farm pepper and some feta cheese. The spicy sausage went well inside the crisp pepper while the feta, mixed with chopped olives and lime, was compelling, a pleasant crunchiness emhancing its creaminess. An excellent course! This was paired with the 2010 Amadieu Romane Machotte, Gigondas, a blend of 80% Grenache and 20% Syrah. A fine Rhone wine, with nice cherry and spice flavors, as well as a bit of an earthiness. It is a more subtle wine with a lengthy and satisfying finish, a very good choice for the lamb. The final course, the pièce de résistance, was a Cheese Sampler with five cheeses from Vermont Creamery, including Creamy Goat Cheese, Cremont, Bijoux, Coupole, and Bonne Bouche. The Creamy Goat Cheese, a fresh cheese, was combined with honey and black pepper and was quite enticing, a nice combination of sweet, creaminess and a bit of a spicy kick from the pepper. The other four cheeses were all aged cheeses, with only the Cremont being a mixed milk cheese, made from both cow and goat milks. All four were compelling, creamy cheeses, each with their own unique character, which any cheese lover would enjoy. Vermont Creamery impresses with their cheese and butter products. The cheeses were paired with gthe 2010 Boulay Clos De Beaujeu Sancerre, a crisp, dry with notes of lemons, grapefruit and minerality. It certainly was not a stuffy evening, especially as they ended the dinner with a rousing song, Cow-Goat-Sheep, which is sung to the tune of Do-Re-Mi from The Sound of Music. Their upcoming Cheese Tuesday dinners will be on November 27, French Favorites, and December 18, An Italian Holiday. The cost is $85 per person, which includes a four course dinner with wine pairings, and I feel it is a good value based on the quality of the food and wine, as well as the fun experience itself. Call L’Espalier at 617-262-3023 to make reservations for the upcoming Cheese events. It is now autumn, with a brisk chill to the air, and the winter season will arrive in a couple months. We often don't think about the fact that in the Southern Hemisphere it is now spring, and they are looking forward to summer in a couple months. Near the end of our winter, grape harvest will begin in countries like Argentina and South Africa. How much do you know about the wine regions of the Southern Hemisphere? You can learn more about these regions in a newly released book, Wines of the Southern Hemisphere: The Complete Guide, written by Mike DeSimone and Jeff Jenssen, the World Wine Guys (Sterling Epicure, October 2012, $24.95). It is a 580 page hardcover book, broken down into seven chapters, each covering a different wine producing country. DeSimone and Jenssen are wine, spirits, food and travel writers and are the Entertaining & Lifestyle Contributing Editors for Wine Enthusiast Magazine. They have also written for numerous other magazines and previously published The Fire Island Cookbook. Their book covers seven countries: Argentina, Australia, Brazil, Chile, New Zealand, South Africa and Uruguay. Each chapter is broken down into five sections: a History & Overview, Major Grape Varieties, Wine Regions, Recipes and In Their Own Words. The greatest bulk of the book consists of information about the wineries of these regions. Australia and New Zealand have the longest chapters, each over 100 pages. It is great to see coverage of Brazil and Uruguay, two countries which seem to rarely be addressed anywhere else. This book is primarily geared toward the novice wine lover, providing more of a general overview rather than a comprehensive and detailed exploration of these regions. A more advanced wine lover may want much more detail than is provided in sections like the brief History & Overview. Personally, I would have liked to see a more extensive exploration of the history of these countries. The Major Grape Varieties is useful, though I would have also liked to see some information on the lesser known grapes too, to see which new grapes may be up and coming. The Wine Regions section, the largest part of each chapter, discusses each country's wine regions and then lists many wineries in those various regions, providing basic information about the wineries with a few tasting notes of their wines. This is more of a starting point about these wineries, a sampling that might intrigue you to seek more information elsewhere. It is the other two sections of each chapter which most intrigued me. Each chapter contains one to four Recipes, usually provided by the wineries, and often represent regional specialties. For example, you will find a recipe for Familia Zuccardi's Argentine Empanadas. I have visited the Zuccardi winery and greatly enjoyed their empanadas, so it was cool to see this recipe in this book. As another example, you will find a recipe for the Pisco Sour cocktail in the Chile chapter, another item I enjoyed while visiting Chile. From Bellingham Braai Pie (South Africa) to Waipara Lamb Chops (New Zealand), there is much to entice the food lover in this section. The final section of each chapter is In Their Own Words, a series of interviews with wine personalities from each region. You will find fascinating interviews with people such as Laura Catena of Argentina (winemaker/owner of Catena Zapata), to Philip Van Zyl of South Africa (editor of Platter's Guide). This section will appeal to wine lovers of all levels, providing intriguing insights into the wine industry of each country. These interviews captivated my attention and I am sure other wine lovers, from novices to advanced, will also find much of interest and value. 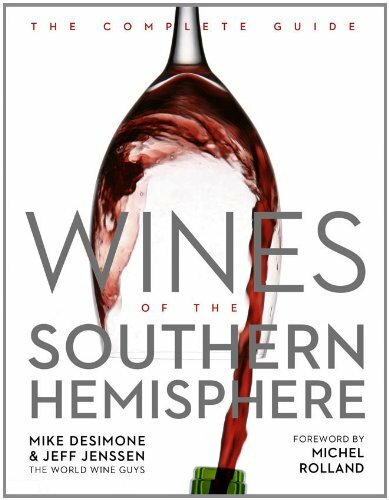 At $24.95, this hefty book offers an excellent value as an introduction to the wine regions of the Southern Hemisphere. Though primarily for novice wine lovers, there are sections, like Recipes and In Their Own Words, which will appeal to more advanced wine lovers too. The chapters on Brazil and Uruguay also provide much needed information on these countries, information which is tough to find in other wine books. With the holiday season, consider this book as a gift for your wine lover friends. Every year, this is probably my most important Rant. It is an absolutely vital issue for everyone who enjoys alcohol of any type, from wine to beer, from Scotch to cocktails. As the holiday season is approaching, this is an especially dangerous period as some people have a tendency over indulge, to drink too much at parties and gatherings. There is nothing wrong with that, and they can drink as much as they desire, as long as they give up their keys and do not drive. As I said before, "If there is any question, no matter how small, whether you are too intoxicated to drive, then don't. If your family or friends think you have had too much to drink, don't drive. Just don't. It is not worth the risk by any calculation." It is much better to err on the side of caution. If you have any doubt, don't drive. I don't want to lose any family or friends this year due to a drunk driving accident. So please just don't! On Saturday, October 27 from 12pm-5pm, the Wine ConneXtion will kick-off the series with its “Third Annual Fall Grand Tasting.” Guests are invited to taste a wide selection of new wines while perusing more than 50 exclusive, hand-selected bottles from all over the world as they enjoy culinary treats from Chama Grill. Guests are then invited on Saturday, November 3, from 1pm-5pm, to expand their wine knowledge with a tasting dedicated to “Magnificent Meritages.” Guests will learn about the elusive category of exceptional American wines blended in the Bordeaux tradition. These wines go through a rigorous screening process just to be awarded the name Meritage and are a treat to taste. 3) Erich Schliebe, L’Espalier’s beverage director, is joined by the 12th generation of the famed Trimbach family, Jean Trimbach. For almost four centuries, the Trimbach Family has been promoting the region of Alsace and its history, focusing on its exceptional terroirs and fine wines, with their estate based in Ribeauvillé, Alsace, France. This iconic winery boasts superb vineyards and outstanding wines that are admired and enjoyed throughout the wine-drinking world. The event is $145 per person. Reservations are required. For reservations, please call L’Espalier at (617) 262- 3023. 4) Boston magazine’s 3rd Annual Taste event, held at the Mandarin Oriental, offers a spectacular evening of culinary assortments from 18 of the hottest restaurants in Boston and Cambridge. Taste attendees will have the chance to savor delectable bites from some of the city’s most esteemed chefs, sip creative cocktails from top mixologists and socialize among fellow foodies. A portion of the proceeds from the delicious dining event will benefit the Greater Boston Food Bank. Chefs from 18 participating restaurants, including: 80 Thoreau, Alma Nove, Artisan Bistro, Davio’s Northern Italian Steakhouse, Ducali, il Casale Cucina Italiana, Journeyman, L’Espalier, Local 149, Mandarin Oriental, Neptune Oyster, Post 390, Sel de la Terre, Shanti, Smith & Wollensky, Trade, Tremont 647 and Tres Gatos. Additional participants include mixologists Chris Olds of Park and Josh Taylor of Westbridge. To purchase tickets visit, http://www.bostonmagazine.com/taste/index.html. Some food traditions seem to get lost in the past, yet they can be quite fascinating and some may even be worth reviving. For example, there is an old tradition involving cheese fondue. Diners commonly dipped, at the end of long forks, cubes of bread into the melted cheese. If a man's bread fell off his fork into the fondue, then he had to buy a round of drinks for everyone else at the table. If a woman's bread fell off her fork, she had to kiss every man at the table. Reviving this tradition might help promote fondue. Over five years ago, I had my first dining experience at The Melting Pot in Bedford-Burlington, one of the few local restaurants where you can experience fondue. I enjoyed my dinners at The Melting Pot and have returned a number of times over the past years. I like the idea of fondue, and feel it can be both fun and intimate. Nestled in the Lover's Lane section, a couple gains a measure of privacy and sharing fondue is quite an intimate act. Larger groups can have plenty of fun with fondue and I once attended a friend's birthday party there. The Melting Pot is a restaurant I have long recommended and continue to do so. Recently, I was invited to The Melting Pot as a media guest to check out a few of their new menu items, and once again I had a delicious and intimate dinner, sitting in the Lover's Lane section. We began with the Bacon & Brie Cheese Fondue, which is made from baby Brie, Gruyere, Emmenthaler, white wine, applewood smoked bacon, chopped onions, mustard, and cracked black pepper. The smoky bacon aromas are prominent as the fondue is prepared in front of you. That bacon flavor also came out in the taste, combining with the savory cheese elements. A potent combination. Though I like dipping bread into the cheese, I especially enjoy the chunks of green apple, which have a nice crispness and a certain tartness. This is a fine, new addition to their cheese fondue selections. The Strawberry Almond Salad is another new addition, with sliced strawberries, honey roasted sliced almonds, crumbled feta, and greens topped by a Raspberry Black Walnut Vinaigrette. A good combination of fresh flavors and textures. Going a little old school, I chose the Wisconsin Wedge, an iceberg wedge with Roma tomatoes, applewood smoked bacon and a large chunk of Emmi Roth Kase Gorgonzola. Rather than the usual dressing, I opted instead for the Burgundy Shallot warm salad dressing. I loved the dressing, with its rich flavors, and it went well with the salad ingredients. Plus, the hunk of sharp Gorgonzola was very pleasing. The restaurant has started a new program, Fondue-for-U, where each diner can select their own entree by choosing 3 items from a 14 choice list. At $19 per person, this is now the least expensive entree option on the menu. Plus, if you get a salad with your entree, it only costs an additional $6, which is a $2 savings off the usual salad price. As there were two of us, we each chose three different items, planning to share. We ended up with filet mignon, shrimp, chicken, BBQ pork tenderloin, Andouille sausage, and duck breast. We also selected the Bourguignonne cooking style, hot oil to cook our food. In addition, you receive two batters, sesame seed and tempura, with six sauces, including Gorgonzola Port, Teriyaki, Sweet & Sour, Green Goddess, Spicy Cocktail, and Curry. This was actually my first time ordering this cooking style and I enjoyed dipping some of the meats, like the duck and chicken, in the different batters, creating a nice coating. The meats were generally tender and flavorful, and my favorite sauce was the creamy Gorgonzola Port. We had plenty to eat and I like the concept of getting to personalize your entree choices. Plus, it is even cheaper than the other entrees. We had just enough room for dessert. Another new addition is the White Chocolate Creme Brulee, which is lit on fire table side. Even if you are not usually a fan of white chocolate, you will likely enjoy this tasty dessert fondue. The caramelized sugars atop the fondue added a crunchy element, which I especially enjoyed with the fruit. You also have plenty of other sweets to dip, from marshmallows to cheesecake. It was a fine way to end our dinner. The Melting Pot has remained consistent over the years and you should check out their new fondue menu. I know some people are reluctant to visit The Melting Pot because they believe it is too expensive. That is a misconception and breaking down the costs shows it is much more reasonably priced than many realize. Two people can enjoy a 4 Course meal for a total of $82-$96. How many other places can two people go and get a 4 course meal for under $100? If you don't want 4 courses, you can order as few as you like, even just a Dessert fondue. The Cheese fondue ($17) and Dessert fondues ($19) are intended for 2 people to share, so the price per person is only $8.50 and $9.50, which is similar, if not less expensive, than what Appetizers and Desserts cost at many other places. And with the new Fondue-for-U, your entree only costs $19 per person. So give The Melting Pot a try. "It's a simple question Doctor, would you eat the moon if it were made of ribs?" Yes, yes I would. And on a beautiful Sunday afternoon, it seemed as if part of Cambridge was made of ribs too and I certainly ate my way through it. In total, I sampled 20 different ribs, which is a great and tasty way to spend any day. I would have tasted 21 ribs, but unfortunately one restaurant ran out of ribs early. This past Sunday, the East Cambridge Business Association (ECBA) presented the annual “Smoke This” Rib Fest 2012, pitting the chefs and pit masters of twenty-one restaurants and establishments against each other in a culinary showdown to determine who made the Best Ribs. Chef Tony Maws, of Craigie on Main, Kenji Alt, the Chief Creative Officer of Serious Eats, and Dave Andelman, of The Phantom Gourmet, were the celebrity judges of this event. There was a second level of judging as well, three local bloggers, including Erica of In and Around Town, William of The Boston Foodie and myself. In addition, the public had an opportunity to vote for their favorite ribs. The twenty-one participating restaurants and establishments included: Abigails, ARTBAR, Atwoods, Bambara, Catalyst, Champions, CRLS Students, East By Northeast, East Side Bar & Grille, Filarmonica Santo Antonio, Lizzy's, Lord Hobo, Midwest Grill, New Deal Fish Market, Ole Mexican Grill, PF Changs, Portugalia, Redbones, Trina's, Tupelo, and West Bridge. The event brought out lots of people, and later in the afternoon there were several long lines at some of the more popular tables. At times, the air filled with smoke and ash from all the grills, and when I went home, my shirt even smelled of that smoke. I was pleased that there were numerous tables and chairs set up along the street so you could sit and eat your ribs. Some of the ribs were expectantly messy so trying to eat them while standing up would not be the easiest. I am sure the fest went through tons of napkins, despite plenty of people licking the rib sauce off their fingers. Unfortunately, no wine was available at the Rib Fest as they chose to concentrate on beer, which was certainly popular, including Pretty Things Beer, Cambridge Brewing Co. and Portico Brewing Co. But a hearty red wine would have pleased me, or even an umami-rich Sake. There was music by Hayride and The Atwood’s Monday Night Bluegrass Band. Fiddles and banjos adding to the festive atmosphere. For $3, you could take a spin on the Wheel of Chance and everyone was guaranteed to win a prize. I took a spin and won a $25 gift certificate to the New England Aquarium. Of course, the main attraction at the fest were the ribs. When you think of ribs, what first comes to mind? Southern style ribs, such as Kansas City, St. Louis, Memphis, Carolina, Texas and more. Though the definitions can be a bit vague, you can generally separate the styles into two basic schools: wet and dry, dependent on whether the ribs are slathered in a sauce or prepared with a dry rub. The nature of the sauce varies, whether thick, thin, sweet, spicy or a combination of sweet & spicy. In addition, the cut, size of the ribs and which bones are removed makes a difference. We cannot forget Asian style ribs either though, and I mean more than the ordinary spare ribs you find at basic Chinese restaurants. Tea smoked, five spice, Thai style and so much more. At the Rib Fest, you got to experience a myriad of styles and preparations. The celebrity judges selected Bambara as the First Place winner of the Rib Fest. They also awarded Second Place to Tupelo and Third Place to the Cambridge Rindge & Latin School. The public had some different choices, awarding First Place to East Side Bar & Grill, Second Place to ArtBar and Third Place to Champions Sports Bar. It is very interesting that the celebrity judges and the public did not choose any of the same winners. That shows how tastes can vary significantly. My own choices for the Top Three Ribs are more in line with the public voting. Before announcing those choices, I want to congratulate all of the entrants for their rib dishes. Judging was not easy because there were plenty of ribs which I enjoyed, each with their own unique attributes. Though I will list my Top Three choices, I will also give a couple Honorable Mentions to other ribs which deserve recognition. Third Place is awarded to Abigail's Restaurant. This was the toughest Place to decide as there were several worthy candidates. Abigail's ribs were Memphis style, a dry rub, with a Kansas City style sauce. the ribs were tender and meaty, with an excellent melange of spices in the rub. I got a side of their house sauce for dipping and found it also to be delicious, with a spicy backbone. These are the type of ribs that you can easily devour a dozen or more. Second Place is awarded to East Side Bar & Grill. They certainly looked very professional, with their huge grill, and it is easy to understand why their ribs are so popular with the public. They called their pork ribs "Texaschusetts" style, a blend of a Massachusetts barbecue sauce with Texas spices on the ribs. This is one of those "wow" ribs which should impress most people. Meaty, tender, and grilled perfectly with a great depth of flavor, both sweet and spicy. You'll want to order a complete rack of these ribs to satisfy your inner carnivore. First Place is awarded to Champions Sports Bar! These ribs had a Kansas City dry rub, were cooked over apple, hickory and cherry woods, and had a glaze that included apples and brown sugar. The moist, tender meat slid off the bone and the taste impressed with its complexity and melange of compelling flavors, both sweet and spicy. The sauce accented the ribs without overwhelming it. This was another clear "wow" dish and I was tempted to remain at their table and devour several more of these ribs. Kudos for such amazing ribs! I want to give Honorable Mention to the New Deal Fish Market for their incredible barbecue sauce. Their southwest style ribs were generously slathered with an Italian chestnut honey-based sauce. This umami-rich, earthy sauce possessed an intriguing flavor. I recently got to taste some chestnut honey and loved its earthiness, and believe it worked great in this sauce. I also want to give Honorable Mention to the ArtBar. Their Spiced Lemon Confit Marinade Baby Back Ribs had one of the best presentations, with greens and focaccia bread. It also possessed one of the most subtle and unique flavors of all the ribs. After the big, bold flavors of many of the ribs, these were certainly a major change. ArtBar also offered a free taste of a new soda their bartender, Elizabeth, created: a combination of pomegranate juice, lime and black pepper. Such a bold, peppery flavor with nice fruity undertones. Congratulations to all the winners! I can't wait for next year's Rib Fest. With the holiday season approaching, many people will stock up on wine to serve their guests at various holiday parties and celebrations. Often, because they are buying bottles in bulk, their primary concern is price. They generally want to purchase wine that costs $10 per bottle or less. That may mean they end up stocking up on brands like Yellow Tail and Estrella. I see a similar thing with people who bring a bottle of wine to a holiday party. They don't want to spend too much money and thus often bring those same brands. Though those might be drinkable, they are not likely to impress your guests. Guests will drink them but no one will remember them after the party. I certainly would rather not drink them at a holiday party. My objection is not because of their price but rather that they are uninspiring. Your guests want to drink better, more interesting, wines than these. When I attend my holiday parties, plenty of the guests seek me out specifically to find out what wines I brought. They know that I am likely to bring something delicious and compelling. My wines will be the first ones they drink and the Yellow Tail and Estrella is what they will drink once my wines are gone. What all these guests may not realize, is that many of the wines I bring are great value wines. Wouldn't you prefer to purchase inexpensive wine that will also impress your family, friends and other guests? That is definitely possible and is not too difficult to do. You have two primary options to locate such wines. First, seek out one of the better discount wine stores. These places often carry a good selection of wines costing $10 or under, much more than you will find at a regular wine store. You can find plenty of variety in these inexpensive wines, whites and reds, domestic and imported. You will find wines comparable in price to Yellow Tail but which offer much more character, complexity and taste. They offer a much better value, and still at a low price point. As one example, I would highly recommend Bin Ends in Braintree. On my last trip there, I bought over 20 different wines, all costing $10 or less. It was an excellent and diverse selection and I have yet to drink one of those wines which was not pleasing. Another example is the Wine Connextion in North Andover, where I attended an event last night. Roughly one-third of their wines cost under $10 and though that includes some major brands, there are plenty of much more interesting wines too. Second, if you shop at a regular wine store, you still have options though it probably would be best to ask a wine store employee to help you find their value wines that cost $10 or less. They can identify those wines which will be more interesting and delicious than the usual Yellow Tail and Estrella wines. You should also remember that most wine stores offer a discount for bulk purchases, sometimes as few as 6 wines, which is another way to save money on your purchases. But if for some reason you can't ask a store employee for some recommendations, then my best advice for selecting a good wine that is $10 or under, is to buy a Portuguese wine. At this time, I think some of the greatest value wines are coming out of Portugal, especially at the price point. Chances are that if you purchase a Portuguese wine costing $10 or less, you will find a delicious and interesting wine. And there are plenty of Portuguese wines available in that price range. There is no other wine region where you can find as many good wines at that price point. At the Beacon Hill Wine & Gourmet in Melrose, the wine store where I work part time, I often recommend Portuguese wines to people seeking great values. So this holiday season, don't buy the same old cheap wines. It won't take much effort to select some better choices, and still very inexpensively. In the end, you will impress your guests and make your holiday party more memorable. Though the Boston Wine Expo won't be held until mid-February 2013, I recently attended a special Blogger preview event at the Action Kitchen of the Seaport. It was my first time at the Action Kitchen and it is an excellent spot for food and wine events. Numerous wines were poured and there were several different dishes for us to snack upon. The Expo is making a concerted effort this year to reach out much more through social media as well as to work with local bloggers. The center of the event was a speech by Jim Carmody, the Boston Seaport World Trade Center General Manager, who discussed the function of the Expo as well as referencing the changes coming next year. Near the start of his speech, he summed up the primary purpose of the Expo: commerce. As they say, it is all about the Benjamins. It is about wineries finding local distributors, distributors finding retailers and restaurants, and wineries trying to raise their brand recognition with consumer. Anyone showcasing their products at the Expo is seeking to make money, to expand their business. This is nothing new or surprising, but it was refreshing to hear. At the Expo, there should be over 200 wineries from more than 15 countries. The Expo is upgrading the quality of their souvenir glasses and will allow for wine sales on site. The Grand Cru Lounge will include food created by local chefs and there will be a special Social Media Lounge. For added business, they will now provide small rooms where wineries and distributors or distributors and retailers can meet to discuss business. The prior, restrictive conditions on bloggers obtaining media passes for the Expo will be loosened, though we don't know at this point exactly what changes will be made. But their goal appears to be to allow a greater number of bloggers to attend the Expo. I think it is very important for bloggers to be able to attend the trade hours of the Expo, so they can taste wines during the quieter time of the Expo, before the public descends upon the Expo. It is far more difficult to properly taste and review wines once the public enters the hall and crowds the tables. Bloggers can help promote commerce. Their wine reviews will live on long after the Expo is over, once the public returns home from their wine tasting weekend. The reviews can be used as selling points by wineries, distributors and retailers. When the public conducts online searches, they can read about the wines and gain a sense of whether they want to buy them or not. The regular readership of these blogs look forward to such posts, to obtain recommendations. Bloggers will talk about these wines through social media channels, from Facebook to Twitter. It may not be an easily measurable area, but there is no denying bloggers can have a significant impact on commerce. One aspect of the Expo not to forget is their charitable contributions. Since the event's inception, they have raised over $1.4 million, which was distributed by the Boston Guild of Oenophilists, Inc. to over 27 charitable entities. Always good to see such charitable contributions. Personally, I would like to see more Sake at the Expo. It is still a rarity there, and it not available every year. The Sake category would benefit greatly from large numbers of consumers having the opportunity to taste some quality Sake. Many people would enjoy Sake, if they only took a chance to taste it. They often have misconceptions about Sake, thinking that it is always served hot, and they need to learn the truth. Thus, having chilled, premium Sake available for tasting will help distributors and retailers sell much more Sake. More information about the Boston Wine Expo will be coming, and if I learn anything more of significance, I will be sure to update my readers. Of the wines I tasted at the preview event, one especially stood out me and it is worthy of a strong recommendation. The 2010 Joel Gott Alakai ($24) is a California red wine blend, comprised of 77% Grenache, 17% Syrah, 4% Mourvedre, and 2% Petite Sirah. It had an alluring nose, great fruit and hints of spice and was compelling on the palate. Complex, with a delicious melange of reds fruits and spice, with hints of earthiness. It was more on the lighter side with smooth tannins and a lengthy, pleasing finish. An excellent food wine, or something you can savor on its own. Just plain delicious. 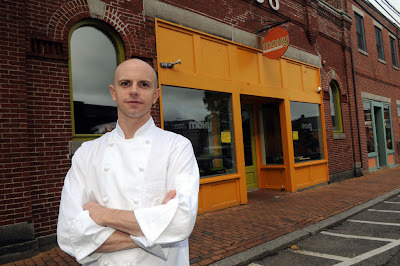 Chef Matt Louis, Chef/Owner of Moxy in Portsmouth, New Hampshire, is a native of NH and graduated from the Culinary Institute of America. Matt worked under Chef Thomas Keller at The French Laundry and also headed with the team to open Per Se in New York City. Of this experience, Matt says, “Every day was an education, and I didn’t want to miss any of it. Working for arguably the most influential American born chef in history was an amazing experience.” Matt eventually left NYC and became a culinary instructor at Southern New Hampshire University, later working at Wentworth by the Sea Hotel and Spa. It was then that he met Portsmouth-area restaurateur Jay McSharry and the two discussed the idea of opening a restaurant in Portsmouth. Prior to opening Moxy, Matt embarked on a series of stages at top restaurants including Noma, Momofuku KO, Torrisi, and Eleven Madison. At Moxy, Matt brings together his appreciation for and commitment to local product, and a desire to make it fun and approachable with food and service at the highest level of quality. Matt says, “Modern American tapas just means really great locally sourced food meant for sharing." I was very impressed with Moxy, with its chef, philosophy, drinks program and food, and you can check out my rave review. As I have said before, it is well worth the drive to Portsmouth and I look forward to my next trip up north. Every dish we do has a purpose, we never just have a dish hit the menu without a reason. Creativity comes in many forms, but for me, it is more about finding purpose, identity and reason...then making sure everything follows that common thread with your own voice. Inspirations come from everywhere...most important and significant are ones I have seen at Torrisi in NYC as well as David Chang's restaurants...not so much what they were doing in terms of actual dishes...but that they had foudn their voice, found their purpose and stick to it. Our dishes come from 3 sources: 1) history and culture of our area 2) our own twists on iconic tapas dishes 3) what the local farmers are growing. Everything fits into at least one of these categories, if not more than one. Start with one of the above 3 listed criteria and let it evolve into something that makes sense for our restaurant...it could be an ingredient that has become available, or a historical or cultural significant dish that we than evolve into our own. Some we do tests, other we just go with....really depends on the nature of that specific dish. You must be highly organized in your operation to allow the time needed to really think, this, coupled with the balance of also trying to maintain a viable business at the same time is the biggest balancing act. It is difficult to continue to push the mental part of what we do when we are really deep in the day to day...it almost has to happen away from the day to day operation...too much going on, too many distractions, and too much to tend to. Hmmm....the fact that we serve burgers...I had no intention on opening a restaurant that serves burgers. However, when the identity became clear that this was going to be a modern American tapas restaurant and all items would stem from that...a huge part of tapas menu is bocadillos (small sandwiches)...traditionally Spanish in approach, we needed to look at how to make this American...the most iconic American sandwich...the burger. We had no choice. We did not want to jump on the "slider" bandwagon, nor did we simply want to serve a burger to please the masses...but when looked at it from the way we got there...it had to happen. I wish the whole "slider" thing never happened...we would have still come to the same conclusion about serving our mini burgers regardless, because it made sense with the thought process of how we got there...it just also happened to be one of the most overplayed items in restaurants...but again, we had no choice, the identity, concept, and reason told us we had to. 1) AKA Bistro, one of my favorite suburban restaurants, should soon have a full liquor license and will start serving a variety of cocktails.At a public hearing on October 1, their application for a full liquor license was approved so now it heads to the Alcoholic Beverage Comission where it hopefully will also be approved. They are planning to create some Lincoln-themed cocktails including: The 1754 (kaffir lime infused vodka, cucumber, sour mix) and The Sandy Pond (gin, green tea, honey, orange juice). Good luck to them! 2) On Saturday, November 3, from 12pm-2pm, the Seaport will host an interactive cooking class for the holidays. Class attendees will work alongside Seaport’s chefs in the interactive Action Kitchen to create Thanksgiving specialties and side dishes while enjoying tasty bites and beverages. Menu items to include: Sherried Green Beans with Wild Mushrooms, Classic Sweet Potato Casserole, Traditional Cornbread Dressing, Fresh Cranberry Relish and the Perfect Gravy. Seaport Beverage Manager Eric Loring will be on-hand to speak to pairing the perfect wines with your holiday meal. Ticket prices for “Creating a Holiday Meal to Impress Your Guests” are: $75 for one guest or $125 for a couple. Admission includes complimentary self-parking in the Seaport Garage as well as side dishes and recipes to go. 3) Doug Bates, President, Greater Portsmouth Chamber of Commerce, has announced the dates for Restaurant Week Portsmouth & The Seacoast: November 8-17. The bi-annual culinary event has 49 locally owned restaurants already signed on to participate with special menus and deals. The restaurants and chefs are planning to celebrate the area's seasonal bounty. At each restaurant, a three course lunch will $16.95 while a three course dinner costs $29.95. I have mixed feelings about these myriad restaurant weeks, as they often times don't offer a stellar experience or food. You have to be really choosy about where you go, as the true gems are not easily found. But some of these newer restaurants weeks lack some of the issues that plague the longer running events, like Boston Restaurant Week. Portsmouth is an up and coming culinary destination, and reminds me in some ways of Portland, Maine. Portsmouth is attracting some very talented culinary talent and it is well worth checking out, so this Restaurant Week gives people a less expensive opportunity to check out the offerings. My top recommendation for Portsmouth is Moxy, which I recently gave a stellar review. Their Restaurant Week menu is not yet online, but I suspect their offerings will be quite compelling. 5) Chef Vittorio Ettore, Chef/Owner of A Tavola, is pleased to announce that Chef Daniel Noonan has recently been appointed as Chef de Cuisine. Chef Daniel Noonan comes to A Tavola from Hamersley’s Bistro, where he worked for over 11 years and was most recently Sous Chef. He strives to emulate Gordon Hamersley’s work ethic and inspiring dedication. As a Chef, Noonan’s top priorities are delivering a great product at a fair price in a timely manner as well as creating two-way communication platforms with his staff and customers. Noonan also admits the three ingredients he could not live without are thyme, olive oil and love. And maybe salt. Continuing the monthly A Taste of Italy tour at A Tavola, Noonan and Ettore have worked together to create an exclusive menu throughout the month of October. This menu will focus on the Lazio region and the simple pasta and roasted meat dishes that dominate tables throughout Central Italy. The pre fixe Tuscany menu is $45 per person, with regional wine pairing for an additional $20. 6) BostonChefs.com is throwing its annual autumn fundraiser on Monday, November 12 at Regattabar from 5:30 to 8:30 PM. Now in its ninth year, Flavors of Fall--co-sponsored by City Square Associates, The Charles Hotel and Cambridge Savings Bank--brings together a dozen of the area's top restaurants in support of a local charity. This year's beneficiary, The Possible Project, utilizes entrepreneurship to inspire young people who have untapped potential, empowering them with the skills required to achieve enduring personal and professional success--skills like leadership, professionalism, self-confidence, teamwork, and resilience. The Cambridge-based after school program enables high school students to start and run their own businesses, participate in a collaborative work experience, and receive individualized advising on their post-high school pathways. Returning Cantabrigian restaurants--Rialto, Russell House Tavern, The Blue Room, Bergamot, Garden at the Cellar, Harvest, Henrietta's Table, Sandrine's and UpStairs on the Square--will be showcasing their tasty wares alongside Flavors newcomers like Amelia's Trattoria and recent neighborhood additions Belly and West Bridge. And because hungry do-gooders are bound to get thirsty as well, Brooklyn Beer, Dreyfus, Ashby & Co., Noir Bar and Native Waters will be onsite serving their beer, wine, cocktails and water. Tickets are available online right now, and the $65 per person ticket price--all of which goes to support the good work of The Possible Project--includes all food and beverages, not to mention a side of jazz courtesy of the Rollo Tomasi Quartet. And once again, J.P Licks will be on hand with their flavorful ice creams and coffees to make sure that you end the night on a sweet note. Since the first Flavors event in 2004, over $75,000 have been been raised for a wide range of Cambridge-based community organizations. Past beneficiaries have included Tutoring Plus, Community Art Center, Second Chances, CitySprouts, CycleKids, CLSACC, On the Rise, and Project Playgroup. Go to the Flavors of Fall Hall of Fame to learn how these groups are enriching the lives of our neighbors in Cambridge and beyond. Carricante, Frappato, Grecanico, Nera d'Avola, Nerello Mascalese. Bring on those indigenous Italian grapes and let me taste their uniqueness. You can find Cabernet Sauvignon almost anywhere in the world, but these grapes are almost exclusively found in Italy. Thus, when I received a media invite to a luncheon with Alessio Planeta of Planeta Wines in Sicily, to taste wines made from some of these indigenous grapes, I was eager to attend. The event was held at Legal Harborside, which I had not previously visited, and it is an impressively designed restaurant. Three stories, lots of glass and the back looks out on the harbor, which can be a stunning view dependent on the weather. The first floor is intended to be more casual while the second floor is more elegant, and the third floor is a year round deck lounge. On the second floor, there is a large and clean open kitchen. I do love open kitchens. The dining room on the second floor is elegant, with great windows so that you can benefit from the view of the water. A nice place for a romantic date, a business meeting, or a gathering of friends. On the second floor, there is also an outside deck area, which would be a perfect place for dining during the summer. It is here where we began our exploration of the wines of Planeta, which owns six wineries in Sicily. Planeta Wines is less than 20 years old, having been founded in 1995 by three cousins: Alessio, Francesca and Santi Planeta. They now own 6 distinct wine estates, totaling about 390 hectares of vineyards, across Sicily, including Ulmo at Sambuca di Sicilia, Dispensa at Menfi, Dorilli at Vittoria, Buonivini at Noto, Sciara Nuova on Etna at Castiglione di Sicilia, and La Baronia at Capo Milazzo. They are devoted to environmental sustainability, and continue to work at making their wineries as environmentally friendly as possible. The reason they do so is: "Because the land and the environment are a collective benefit as well as the company’s heritage, and it is a duty to make every effort to preserve it.". Alessio Planeta, pictured above, was personable and down to earth, obviously passionate about wine and Sicily. He is the the Chief Winemaker at Planeta, and has also been working to identify unique terroirs in Sicily. Interestingly, the harvest in Sicily can take about 3 months, especially as the Carricante often won't get picked until the later part of October. Though Sicily is well known for its red wines, Alessio feels that white wines do very well too, and based on what we tasted, I would wholeheartedly agree with him. Though Sicily has intriguing indigenous grapes, and Planeta produces wines from many of them, they have also introduced some international grapes as well, including Cabernet Sauvignon, Chardonnay, Merlot, Syrah and Cabernet Franc. They believe that wineries worldwide are often judged based on wines made from such grapes, as well as the fact that consumers are far more willing to purchase wines made from those grapes rather than some exotic Italian grapes. It is much easier to sell a Chardonnay than a Carricante. I understand their reasoning, but for me, it is those indigenous grapes which I find the most compelling. It is the indigenous grapes to me which often seem to best reflect the terroir. As we mingled on the outside patio, we got to sample the NV Etna Brut, which is produced from 100% Carricante from the Mount Etna region. Carricante, also known as Catanese Bianco, is a white grape thought to extend back to the 9th century and is primarily found in the Etna region. It is a late maturing grape, thrives in high altitudes and has a high acidity which allows it to age well. Mount Etna is the largest active volcano in Europe, and the third largest in the world. Its black lava sands contain a rich mineral content, which tends to produce wines that show strong mineral notes. The Carricante vineyard consists of 16 hectares, located at an altitude of about 870 meters. This is the first vintage of this Brut, only 6000 bottles were produced and it is not yet available in the U.S. It remains on the lees for at least 12 months before disgorgement and has an alcohol content of 12.5%. This was a delicious sparkling wine, crisp and clean with flavors of green apple, lemon and a thread of minerality. A fine apertif, it would pair well with a variety of foods as well, from seafood to cheese. Though it isn't available here yet, it was educational to experience the potential of the indigenous Carricante. As I believe this was the first time I had ever tasted a wine made from this grape, I was impressed. My education on the Carricante continued, as I got to taste a still wine as well. As we watched a short video about Planeta, with gorgeous imagery of Sicily, we sampled the 2010 Carricante ($36), a white, still wine also made from 100% Carricante. It remains on the lees until the February after harvest when it is then bottled. It has a light gold color with an exciting aroma of apples and floral notes. On the palate, it was crisp, clean and complex with a dominant steely minerality and subtle fruit flavors, including pear and green apple. A lengthy and satisfying finish, this would be an excellent seafood wine and it should age very well too. Another stunning wine, I would heartily recommend it. It was then time to sit for lunch and the first course was a delicious Ricotta Gnocchi with truffle and squash. There was a delectable creaminess, enhanced by the earthiness of the truffles, and it was paired with two wines, a 1998 Chardonnay and the 2010 Cometa. The 14 year old Chardonnay still possessed a good amount of life, and was enjoyable, but still could have been produced almost anywhere. I was more interested in the 2010 Cometa ($43), which is made 100% Fiano and sees no oak. The Cometa was aromatic with an intriguing taste, a complex blend of more tropical fruits, a touch of honey and a backbone of minerality. It paired well with the dish, and though pricey, should appeal to a wine lover seeking something more unique. As we savored a superb and creamy Lobster Soup with a puff pastry, we enjoyed two wines, different vintages, 2004 and 2010, of the Cerasuolo di Vittoria, which is a blend of 60% Nero d'Avola and 40% Frappato. The 2004 was an amazing wine, with its enticing aroma of dark berries and earthy notes that led to its seductive and complex flavors. Black and blue fruits, minerality, hints of herbs and other tantalizing yet elusive flavors that flitted back and forth in my mouth. Smooth, with nice acidity, the finish was lengthy and satisfying. My highest recommendation, especially considering the price of the latest vintage. The 2010 ($23) is a bigger wine, with stronger tannins, and doesn't seem as complex. It was still tasty, with more red fruit flavors, but I think the wine might benefit from a bit of aging. If it ultimately becomes like the 2004, it will be a killer wine. With a course of Roasted Sablefish, we drank two different vintages, 2005 and 2007, of the Santa Cecilia, produced from 100% Nero d'Avola. This wine generally sees 12 months aging in French Allier oak, 2nd and 3rd use. The 2005 was excellent, with a spicy aroma and a light, easy drinking style despite its complexity. Delicious red fruits, spice accents and mild tannins. The 2007 ($43) is a bigger wine though not a powerhouse. A similar flavor profile, though with brighter, bolder elements. I would love to drink these wines with a hearty pasta dish. Another strong recommendation. The Roasted Beef Tenderloin with blue cheese, pureed potatoes, and port wine sauce was superb, a tender, flavorful slice of beef with an addictive sauce. The two wines with this course were the 2004 and 2006 Burdese, a blend of 70% Cabernet Sauvignon and 30% Cabernet Franc. These wines did nothing for me, and I felt they had too much of a green pepper/vegetal taste for my own preferences, though others seemed to enjoy them. For dessert, the Mocha Macadamia Mousse Cake was rich, chocolaty and sweet, as well as beautifully presented. The 2010 Nerello, from Mount Etna, was produced from 100% Nerello Mascalese and aged in oak barriques for 8-10 months. This is its first vintage and it possessed a very light red color with a strong cherry aroma. On the palate, it was light, lively and elegant, with touches of cherry and spice. A fine ending to the dinner, and it did pair well with the chocolate. "Alcohol is all about escapism." For many people, Rum brings to mind tropical drinks in the Caribbean. Yet Rum involves much more than just the Caribbean and New England was also once a hot spot for rum production. In a previous post, Rum: A Brief History & Trivia, I discussed some of the history of this intriguing spirit. Yet the origins of rum may extend much further back in time, at least according to Karen Hoskin of Montanya Rum. Karen led a free seminar, Resurrection Of An Icon--Rum On The Rise, discussing its history, the various styles, ingredients, production, cocktails and more. In addition, she discussed a bit about her own rum distillery and rum bars in Colorado. You can read my previous review of her two rums, the Oro Dark Rum and Platino Light Rum. Karen provided some very intriguing information about the history of rum and it was a worthy seminar. It all began with India. On a beach in Goa, India, Karen began her relationship with rum, sipping some Old Monk Rum and having an epiphany of sorts. As the importer is located in Massachusetts, Old Monk is available locally. In the conventional history, sugarcane allegedly originated in New Guinea around 6000 BC and spread from there to the rest of the world, though Karen believes that sugercane may have also developed independently in India, and that it was an East India strain that led to its hybridization. In addition, Karen feels, and she is supported by other historians, that India may have produced the first sugarcane based alcohol, the ancestor to modern rum. The ancient Malay people also produced a sugarcane based alcohol that they called "Brum." Interesting how that name is so similar to "rum." During the travels of Marco Polo, he spoke of a sugarcane based alcohol he encountered in Iran. Our more modern rum industry spread from Brazil in the 1620s, to the Caribbean in the 1650s and then New England in the 1660s. There are two primary rum production ntraditions, that of the islands and that of the mountains, sea level versus higher elevations. Rum also varies by the main ingredient, such as molasses, processed sugarcane juice, or raw cane. Island rums are often molasses based, and it needs to be noted that molasses has a high sulfur content, which can be dulled with age. Island rum also ages quickly and can emit a bit of sulfur on the finish. The quality of the water used to produce rum is also very important. When producing Montanya Rum, Karen decided to produce a rum in the mountain tradition and using raw cane. Raw cane lacks any sulfurous by products and Ron Zacapa is one of the other rum distilleries that produces a raw cane rum. Montanya Rum uses sugarcane from Maui, Hawaii, which is traceable from a labor union sugarcane farm. Sustainability has become a growing concern for Karen. A $4000 pallet of raw cane will create a couple thousand bottles of rum, a higher yield than they once produced. Colorado water, from a 350 feet deep well, is used, which has a good minerality and would work well to produce any type of spirit. The distillery is more of an old style facility, using two alembic copper pots from Portugal. They produce about 90,000 bottles of rum annually, split equally between Oro and Platino. Most of their rum is sold in Colorado but it is currently available in 37 states, with major growth in Southern California. The new markets of Atlanta and Las Vegas are also showing potential. Karen also briefly categorized the history of rum cocktails into four main types: Islands (with tropical fruits), Tiki (with different herbs), Classic (Cuba playing a major role) and Contemporary (with a culinary edge). Karen and Brice Hoskins own 2 rum bars and the only rum sold at those bars are their own two rums. They have over 100 cocktail recipes, and all of those recipes can be found on their website. Their best selling rum cocktail, outselling all others by 2 to 1, is the Maharaja, which is made from fresh ginger, chai spices, and the Oro Dark Rum. We got to try this cocktail and it did have a pleasant spicy edge to it. Tonight, why not make a rum cocktail and escape. In the U.S., Irish Whiskey had great growth from 2010 to 2011, a boost of 23.9%, though it is still a small category at approximately 1.76 million cases. The most popular choice in the U.S. as well as its native Ireland, is Jameson Irish Whiskey. It is ubiquitous in airport duty free shops and Russia has become the second top consumer, jumping from seventh place in the span of a single year. Jameson has just invested in a new distillery to double their capacity and they already possess the largest distillers in the world, which were hand crafted. Jameson Irish Whiskey held a seminar where they introduced the Jameson Black Barrel, as well as discussed the art of cooperage. I find the art of cooperage in the wine and spirits industry, the creation and maintenance of barrels, to be fascinating. There is still much mystery in the use of barrels, such as how two seemingly identical barrels, containing the same alcohol under the same conditions, can produce different tasting alcohols. It is also an art which retains its historical roots, with some of tools and methods remaining relatively unchanged for thousands of years. Master Cooper Ger Buckley, pictured above, is one of four coopers at Jameson. He is the fifth generation of cooper in his family and has been working as a cooper for about 36 years. He has hopes that a nephew will become the sixth generation, though Ger will be getting an apprentice next February. Ger discussed the job of the cooper, showing some of the tools he uses as well as discussing Jameson Irish Whiskey in particular. The first evidence of cooperage extends back to the ancient Egyptians, around 2000 BC. Many of the tools coopers still use extend that far back as well, including the ax, adze and hammer. All of the tools and activities used in cooperage seems to possess their own unique name. Ger told us that the procedure for cutting trees for staves for barrels is called quarter sawing, as the tree trunk is essentially cut into quarters. Interestingly, when using a plane on a stave, you actually hold the plane solid and move the stave over it, which is the reverse of usual woodwork. He also explained the reason why whiskey barrels are now charred. Originally, many of the barrels were previously used, such as to store and transport fish. That fish smell pervaded the barrel so would have ruined the taste of the whiskey. Just cleaning the barrel was insufficient to remove the fish smell so they charred the inside of the barrel to remove the odor. They later realized that the whiskey actually tasted better in the charred barrels, and started to do so even when it wasn't necessary. Did you know that the first Kennedy brothers to come to Massachusetts were coopers? This is a short video of Ger taking apart a barrel so we could have a closer look at an individual stave. It is interesting how everything fits together as it does, sufficiently tight so that no liquid leaks out. For Jameson, they use only high quality barrels, obtaining their used bourbon casks from a U.S. distributor and their used sherry barrels from a bodega in Jerez. Their whiskey does not possess an age statement as the blender does not want to be restricted, desirous of the ability to select whiskey when he feels it is ready. In general though, the regular Jameson Irish Whiskey has a rough age of 5-7 years while the Black Barrel has a rough age of 8-16 years. At distilleries, you may find pot stills or column stills, or even both. But, in the world of Irish Whiskey, "pot still whiskey" has a specific meaning, and not what you might think. It is a blend of malted and unmalted barley produced in a pot still. It is the unmalted aspect which differs from usual pot distilling. It was originally created in an effort to reduce an English tax on malted liquor. In general, it leads to a creamier mouthfeel in the whiskey. The Jameson Black Barrel ($35-$40) is only made once a year, a total of around 9000 cases, and is sold in only a limited amount of countries. They wanted to create a sweeter style whiskey and I believe they succeeded in their objective. The Black Barrel is a blend of pot still whiskey and small batch grain whiskey, and they use virgin bourbon casks for aging. It has a sweet aroma, actually reminding me a bit of a nice bourbon, and on the palate, there is plenty of sweetness, yet not cloying. There were creamy tastes of vanilla, caramel, honey and even toasted marshmallow. It was mellow and smooth, with a lengthy and pleasing finish. A fine sipping whiskey, especially on a chilly autumn or winter evening.